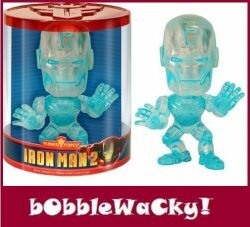 Funko Force Vinyl Figure Bobble-Head IRON MAN 2 MARK VI Limited Edition HOLOGRAPHIC with bobbling head! COOLEST EVER! Straight from the awesome film starring Robert Downey Jr and Mickey Rourke comes the Limited Edition Holographic IRON MAN MARK VI, in the form of a cool limited edition Funko Force Bobble-Head. Vinyl figure stands about 5" tall. Moveable arms and head bobbles. Collect all the Marvel heroes/villians! Buy him NOW while you can still see him!